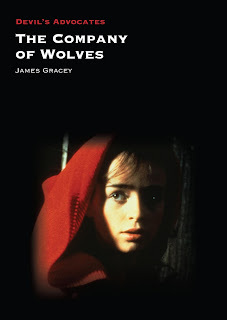 I’ve just submitted the final proofs of my monograph on The Company of Wolves (part of Auteur’s ‘Devil’s Advocates’ series), so it won’t be too long before it’s available to pre-order. I also wanted to share a preview of the beautiful cover design (right). The Company of Wolves is a dark fantasy film quite unlike any other. A meditation on the horrors of the adult world, and of adult sexuality, as glimpsed through the dreams of an adolescent girl, it amalgamates aspects of horror, the Female Gothic, fairy tales, werewolf films and coming of age parables. Drenched in atmosphere and an eerily sensual malaise, it boasts striking imagery immersed in fairy tale motifs and startling Freudian symbolism.